I started the day thinking our pace would be a little slower, since today marks the beginning of Pam's speeches, but it turns out we met just as many amazing people and feel even more inspired. 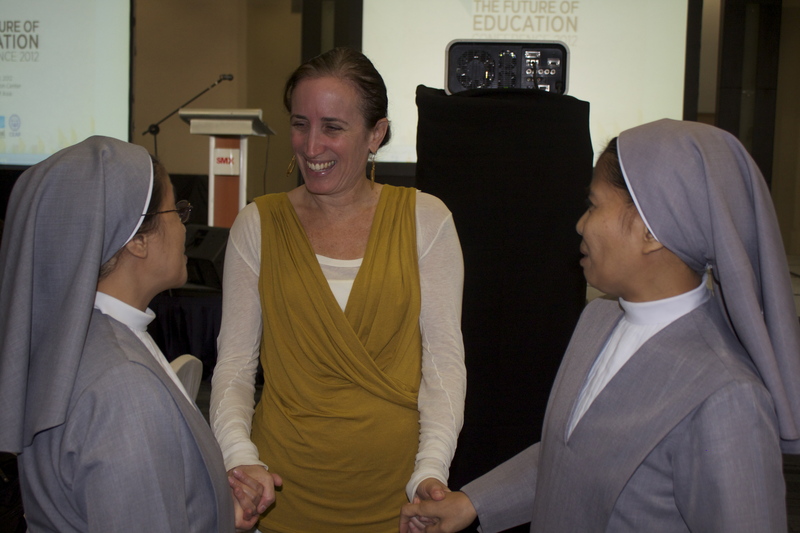 Today Pam spoke to an audience of 120 bishops, archbishops, priests and nuns at the Catholic Education Association of the Philippines annual conference, hosted by the Vibal Foundation. These men and women make up the superintendency of the largest private school network in the Philippines. Many of them work in the most remote areas of the Philippines, deep in the forests of the north, or on tiny, hard to reach islands of the south. One sister we met traveled 11 hours by bus to attend the conference. The topic of the conference was education in the 21st century, and they all had the same question: how do I teach digital natives using technology? Pam gave an excellent speech, and told many amazing stories and made the audience laugh, think and connect. Afterwards many participants came to us and asked about LitWorld's work, and how they might connect it to what they do in their schools. Tomorrow Pam speaks to their delegation of over 2000 teachers on universalizing the Common Core standards. Amazingly, the Philippines is in the midst of switching from a grades 1-10 school model to a K-12 model, largely based on the US education paradigm. We are witnessing an education revolution and entering the Philippines during a time when LitWorld can make the largest impact. The system is changing from passive to active, compartmentalized to interdisciplinary, local to global. After talking with the educators today all i can think of is, how can we help? What can we do? Can't wait to get back to NYC and share all our thoughts! After the lecture we went to the Vibal Foundation offices. The foundation is the charitable arm of the Vibal publishing house which was started by Gus Vibal's mother in the 50s during the "golden era" of the Philippines. She is now 90 and still comes to work every day. Sir Gus (as they call him) gave us a tour of his office, including his 50,000 book collection which he expands by 300 books every weekend!!! Gus said his goal in life is to make paper obsolete through the Vibe tablet, a multimedia learning tool that teachers and students can use regardless of internet connectivity. No internet? Use a server. Some internet? Use a server until nighttime when upload speeds are faster and your data can sync to a cloud. We met a lot of people from Vibal today, and each of them was generous, passionate about the work and incredibly supportive of LitWorld. Every idea we had they were like, let's do it, we'll fund that, we can make that happen. There is so much synergy that I can barely handle it! We also got to tour the manufacturing section of the publishing house. Have you ever SEEN a book being published? Holy cow. All in all another amazing day! More proof of the thoughtfulness of the people doing good work here, from grassroots feeding programs to huge foundations, everyone is thinking and doing in ways that are highly innovative and much needed. This past weekend, I spent time with the women of Sarilaya, a women's organization whose cause is centered on female empowerment and healthy living. They support women who earn livelihood in the rural areas, and the women and families they support grow organic foods. They have children’s centers in these rural areas to help the men and women who are out working all day. I had the opportunity of training the incredible mothers and teachers on the LitClubs curriculum, and they are preparing to launch 9 new LitClubs at the start of the new year! What I loved about this experience the most was the opportunity to hear the stories of Filipina women. 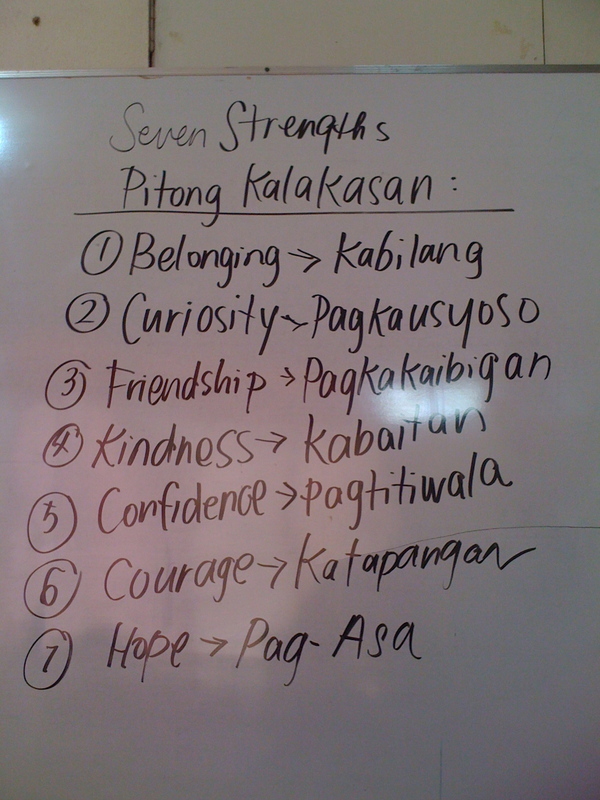 I learned so much about their daily struggles, their victories, and their strength. Their lives are centered around being good mothers, providing for their children, and caring for the children in the centers. It was beautiful to laugh with them, to listen in to their stories of resilience, and to witness their determination to create better futures. Pam Allyn, our Executive Director, helped me put together the agenda for the LitClubs training, and we made sure that the training would be inspiring and igniting. We wanted the women to feel the essence and spirit of our LitClubs, and sure enough, the women smiled brightly as we went through each exercise, as this training became a space for them to get re-inspired and refueled as they continued their work of caring for the young ones. Sharing our stories together was a priceless experience. The best part about it all was the fact that we all learned something valuable from each other. I was glad I had the opportunity to create an empowering, uplifting space for us all. I was compelled to apply for funding, and applied to the Davis Project for Peace, through the graduate residence I stay in, International House, New York. I was awarded a $10 000 grant by the Davis Project for Peace to implement teacher training using technology in South Africa, and incorporated LitWorld as a partner into the project. I completed the project over three and a half weeks in Athlone in the Western Cape. The incentive for the project stems from an article I read in the New York Times in September, 2009. The article discussed the situation in some South African schools today regarding lack of motivation in teachers, especially using technology in the classroom. The article was based on a school identified by the Khanya Project as being desperately in need of motivation and support to instill a culture of learning, especially through technology. I proposed a Teacher Training initiative that uses teacher's personal narratives as a motivational tool to write personal stories using computers, to allow teachers to access and use technology in the classroom. The Teacher training project involves getting teachers fully motivated and on board by developing and implementing a technology curriculum for teachers that integrates literacy skills and social networking, and by giving teachers an incentive -to create their own digital story using technology. I approached the NGO, LitWorld, based in New York, and the Founder and Executive Director, Pam Allyn, a Teachers College Alumnus, generously agreed to pilot a curriculum that integrates the digital resources that are quickly becoming the primary mode for literacy development and (LitWorld’s) core philosophy of transformational literacy in a way that would significantly impact teachers and students in South Africa. LitWorld generously supplied a suitcase full of books for children which will became the parting gift to Bridgeville Primary School to be added to their library for every learner (and teacher) to access. What makes these specific books beneficial is that all these books are being read and integrated into the literacy-using-technology teacher workshop.